Over the years I’ve hiked up Tumalo plenty of times, and been to the top of Bachelor many times more than that, but never both on the same day. 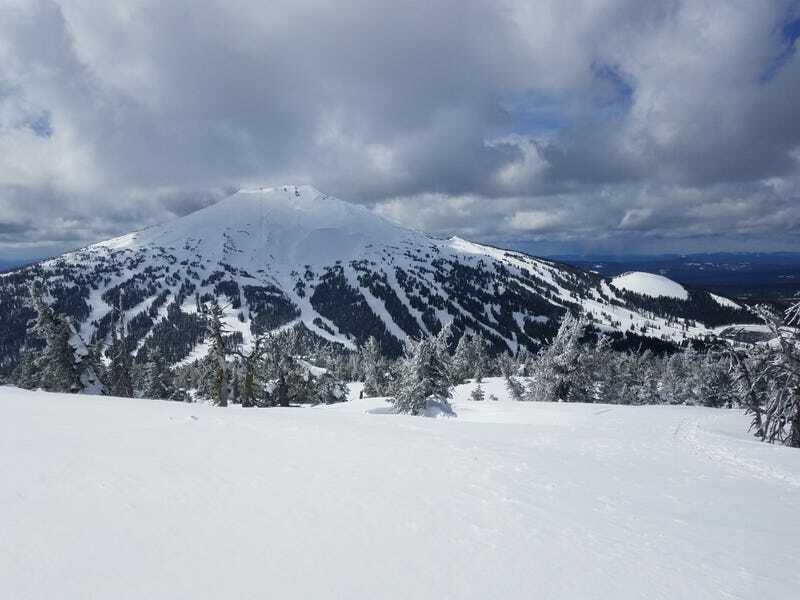 This is due a to a variety of factors, I usually hike Tumalo early in the season and Bachelor’s schedule for summit being open is about as regular as Donald Trump after 3 Big Macs. Also, hiking is hard when there’s a perfectly good lift nearby. Today though I did it. A perfect window of a light dusting the day before, and conditions being fairly sunny and clear made an attempt worth it. Starting at the base of Tumalo it took me about an hour to bootpack up, I had snowshoes in my car, but the snow was firm enough to not need them. A clear view greeted at the empty top. With the exception of some snowshoers I had crossed on the way up, I seemed to have the mountain to myself. From there I rode back down towards the car over some interesting crust on crust, and managed to pop out right above the parking lot. Something I’ve failed to do on multiple occasions, the worst requiring a mile long hike back to the car. After a quick break to eat an apple and take my boots off, I drove across the street to the locals ski in, ski out parking lot. A much appreciated lift ride, and traverse over to the base of Summit, followed by another chair ride delivered me to an elevation of 9000'. Across from me was the top of Tumalo 2000' lower in elevation. I immediately rode back to the car from summit, as my legs were basically shot, but it was a pretty rewarding experience.